OnePlus CEO Pete Lau on Wednesday announced that company’s OnePlus 3 and 3T smartphones will both be updated to Android O. 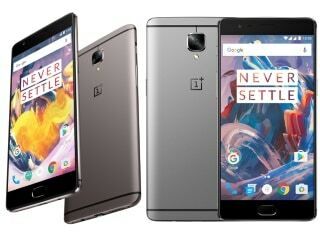 Considering that OnePlus X and OnePlus 2 users have been vocal about their displeasure about not receiving major updates since the launch of the smartphones, OnePlus appears committing to be treating OnePlus 3 and 3T users differently, promising the second major update since launch – following Android Nougat. No timeline was revealed. Notably, OnePlus launched both OnePlus 3 and OnePlus 3T smartphones last year in June and November respectively. Last week, OnePlus surprisingly announced the discontinuation of its OnePlus 3T smartphone and said that this is the last chance to buy the smartphone before it goes out of stock. However, this announcement is likely to make potential buyers wait for the upcoming flagship OnePlus 5 smartphone, which will be launched this Summer. Officially, the OnePlus 5 has been confirmed to sport a Qualcomm Snapdragon 835 SoC, a front-facing fingerprint sensor, and a camera developed in partnership with DxO. OnePlus 5 leaked specifications indicates that the smartphone will come with a 23-megapixel rear sensor and a 16-megapixel camera at front for taking selfies. As the phone has a dual camera setup at the back, how does 23-megapixel sensor fits in the scheme of things is currently unclear. Apart from the cameras, the new listing of the alleged OnePlus 5 suggests that the dual-SIM smartphone will run Android 7.1.1 Nougat out-of-the-box and will feature a 5.5-inch QHD (1440×2560 pixels) display. The successor to OnePlus 3T has been suggested to be powered by a 2.35GHz octa-core Snapdragon 835 SoC coupled with 8GB of RAM. The listing suggests that the OnePlus 5 will come with 64GB built-in storage, which will be expandable up to 128GB. In terms of connectivity, the upcoming flagship from OnePlus has been suggested to offer 4G connectivity, Bluetooth, Wi-Fi 802.11 a/b/g/n, and GPS. The listing suggests that the OnePlus 5 measures 152.7×74.7×7.0mm and weighs 156 grams.